If you have action or installation shots send them to paw@protectiveathleticwear.com and they could be posted here! Received the mini pads on Friday (thanks for the lightning fast delivery) and they were absolutely awesome! They were perfect and my boss is really going to get a kick out of them. Thanks again for the great communication and even better product. I want to say thank you so very much. I Played for the first time in the pads last night and let's just say WOW!! They are perfect. 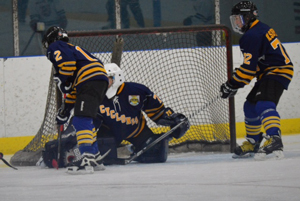 My team was skeptical about wearing new pads in a game but there was absolutely no problem and they moved great. I will get you some pics on ice as soon as I can. The knee pads are built like tanks lol. They're better than I thought they would be. Just wanted to say thanks and you have been great to work with. They are big step up from what I worn before. My previous knee pads were the itech with the plastic knee cap. They were bulky and just not that great. Just wearing out of the box they feel basically broken in and comfortably fitting then anything thing I've worn before. I've worn some bauer knee pads that looked somewhat like yours, except not even close in protection or comfort. Even with adding the extra hd airgel they don't seem/feel bulky. They match up well with my brown excel 2100 leg pads. Also since I'm pretty old school with my leg pad setup, they have no landing gear/knee cradle with a open area how Martin Broduer used to have on some Reebok pads. . Thank you sara, all arrived today and laced into my pads nicely, will let you know how they go after training tomorrow. Sticker already has pride of place on the fridge of win. Just wanted to let you know my son loves his Paw knee pads! Hi Sara, Just wanted to leave you that review of the knee pads I promised! As you know I was hesitant because I had never worn knee protection before, but with just the first skate in my new PAW knee pads I knew they were exactly what I was looking for! 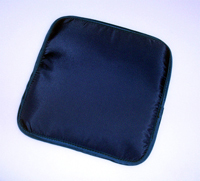 The quality and build is better than any "big name" brand and the absence of hard plastics in them makes the pads very comfortable and prevents any slipping. I don't even have to tape them or use a garter belt, they integrate perfectly with my equipment. 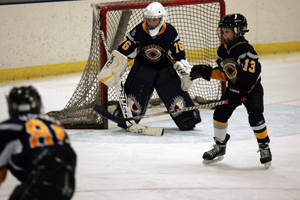 I'm on the ice six days a week so break in was very fast with the knee pads, no issues there. I love the pads, and while the protection they offer is superb, their comfort is what was more important to me and my favorite thing about them; like butterflying on "little cushions"
Thank you very much, and you've made a lifelong customer out of me! Perfect!!!!! I know they are just straps, but I love your workmanship! I just received the cup and Sweat band in the mail today and as usual, they are both fantastic! Thanks again for everything and for having such phenomenal customer service and quality products. The knee stacks arrived yesterday and I was so excited I installed them right away. They are a perfect fit and look like they came right from the Vaughn factory. Incredible work! I won't have a chance to get them on the ice for a week, but I cannot wait to try them out. Thank you so much for your patience in talking through the design with me, and thank you for the amazing quality of craftsmanship. The knee pads are awesome. Miles better than what I was using. Thanks again! Wore the knee stacks for first time last night. I was adventurous and wore both on each pad. Even though it took me the entire warmup pre-game to get used to the bulk ones, wow did they work well! 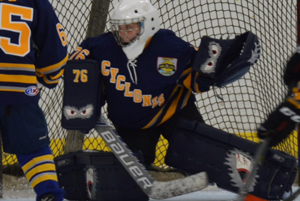 I know they prevented at least one goal that I swore went by me, but didn't due to stacks helping me flush my pads to the ice just a half second quicker than without them. The best part? My hips, knees, calf muscles and ankles say thank you. I didn't feel any stress on them through out the game and my legs didn't get nearly as tired as normal. Thank you to Sara at PAWS! Excellent service and product. Think I'm going to remove the knee cradle for more room as I wear knee pads. Sara: I've been remiss in not complementing you on the outstanding job on my shoulder floaters and elbow protectors. As they say life intrudes but I had to complement you. You do such outstandingly excellent work and I'm happy to support you. 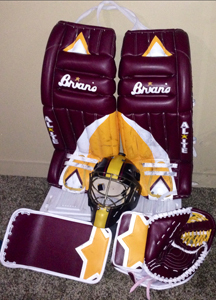 The NHL teams should be flocking to your door to do custom work for their goalies, it is that excellent. Thanks again for the equipment. Sara's work is fantastic! I first ordered a set of knee pads from her and I'm still using them after four seasons. They are still looking and playing like new. 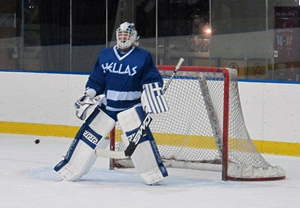 Recently I had a full set of pads and gloves made up and after playing half a season in them, I am continuing to be impressed by the quality of the gear and how well they work on the ice. And a huge shout out is in order for the customer service! Sara has been great at responding to messages and making my convoluted descriptions of what I want into amazing goalie gear! I'll be wearing her gear proudly for many years! Sara's work is incredible and she is very helpful. Pictures on the internet DO NOT do Sara's knee pads justice. These babies are made from krypton! Absolutely the best crafts(wo)man's ship I've ever seen on any piece of goalie equipment I've purchased in my life. extremely happy with the service and overall product I received from you! The pads are working out great! Beckham is in love with them, and has been playing very well. He is much more confident and his team thinks they look awesome. One of the refs came up to him during the game and told him they were the coolest pads he has ever seen. Here are some action shots for you. Here are some action shots of Beckham in action with your AWESOME PAW pads and modified gloves. Feel free to use any of these with your website or marketing. Needless to say his gear is the talk of the club, and he is playing better than ever! I got my knee pads on the 23rd of December. I received the knee pads 3 weeks ago and I played games with them. Thanks again and keep up your good work! I wanted to get a good review of your product and I think I am at the point where I can tell you these knee pads are by far the best I have ever used. I have been thru a set of Reebok’s, D & B’s, Coopers and even some homemade stuff from volleyball elbow pads in my 26+ years of playing goalie and these rock. I do not even notice I have them on when I am out on the ice. I just wanted to thank you for providing us old beer leaguers a way to stay out there. You make a quality product with way above average service on a custom made piece at a comparable price. That is unheard of today and I just wanted to commend you for it. Sara, I've had a chance to play in my new knee pads twice now and I must say they truly are perfect! I can't believe how many different pairs I've been through and yet never tried yours. Your straight forward design is what makes these great! No bulk. No extra moving parts to get caught up. They truly are the best knee pad I've ever had....thank you so much!! I received my knee blocks and boot risers today. The craftsmanship blew me away. Thank you so much. Fabulous work. You will be highly recommended to my peers! I used the knee pads last night for the first time durring a game. comfortable and fit perfectly within my knee locks. Thanks so much for the great knee pads. 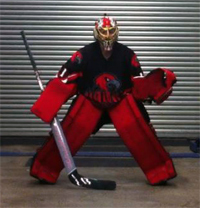 Details of the Recommendation: "Sara makes some of the best hockey goalie equipment out there. Her affordable gear is spot on for fitment, style, and construction. 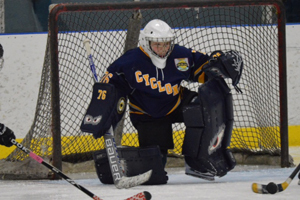 I would highly recommend anyone that plays goalie or has a son/daughter in between the pipes to check out her custom equipment and accessories, including her infamous knee pads. Thanks Sara for making my game better and saving my knees & thighs!" Hi there, just wanted to let you know that I received the knee pads. I got to use them last night in a practice and I must say they are totally perfect. Not too bulky and perfect protection and comfort. Top notch product. Thank you very much for the knee pads, I got them in yesterday. You completely nailed the sizing on the garter belt! Can't wait to try them out today. Thank you again and I will definitely order from you again in the future. on Friday. He wore them on Saturday. said. Were they comfy? "Yup"
Room in the knee cradle? "Yup"
I just wanted to say that I received the knee pads awhile ago and they fit great. Today they stood up to fat wrister and I didn't feel a thing, so you've got one more happy customer. and protective. I can move well in them and feel completely safe. Thanks for the hard work and great design! Hi Sara, Got the knee pads last night. The fit is excellent! Thank you so much for the very quick work on these. Even got them back in time to play in my weekly pick-up tonight. Hi Sara, Just wanted to let you know I just installed the pro palm kit in the palm, on the back over the fingers, and relaced most of the glove. It feels like a new glove! I was on the fence about buying a new glove, but now I don't think I'll be needing one for a while. Thanks for yet another great product! I also showed my local hockey shop the Padskinz and how I installed them on my pads. They seemed pretty interested, and I told them to get it through you. My daughter is still wearing her PAW jill 3 years and counting! The boot risers have arrived and been tested. The product is amazing! Thank you so much! I got the knee pads today! They look awesome and feel even better. I went from my thigh board to some Bauer knee pads that didn't protect much. WOW! very comfy and I feel confident I'm not gonna get hurt wearing these. Added bonus, they improved my butterfly! Just got my kneepads today and even used them as well. I love them! I'm so impressed with the quality and feel. Thank you so much, and I know that these will last me a long time. Jake took this picture of himself in his new PAW gear! Great to deal with. Had my gear all custom made. Used for over a year now and still looks new. I used the new kneepads a couple of time now. They are fantastic! I have taken at least two shots off them now moving back across the ice. I heard them but never felt them! Great piece of kit and vey comfortable. Just wanted to drop you a quick note to thank you for the excellent knee pads. They are perfect and the only kneepads which in my experience stay in place without having to be tied in place. At first I was a bit concerned as they were a bit tight, but after breaking them in for 2 sessions on the ice, they fit like a glove. I would recommend your kneepads to any goalie. I received everything and had the chance to use them for a couple of games. Tonight during a scramble, I took a hard wrist shot off the knee and all I can say is THANK YOU! I was totally protected. Just a little thud and no pain, no bruising. Everything is amazing, super awesome and they feel great. Just wanted to write and thank you for making such an excellent product! Hey Sara. I got these last week. They look and feel really sweet!!!!!! Thanks for making them for me. They felt and performed great on the ice. Thank you THANK YOU!!!!!!!!!!!!!!!!!!!! Sara! Wanted to update you... the mask strapping turned out AMAZING!!! I used it this past weekend, it was PERFECT! I also installed the thinner black HD foam you sent and it worked perfect. Thanks again, I truly appreciate your expertise, service, and awesome work! Thanks Sara. I've been playing for years and have a lot of goalie friends. We're an eccentric bunch. I'll be sure to let them know about your products and customization. We're always looking to do things with our gear. Got everything today and everything is perfect. I now see what everybody likes about the knee pads. I had my son hit me on the knee with a stick and yes, I felt the impact, but no pain or damage. You seem to have found the right compromise, excellent protection without extreme bulk. The slash pads were 100% as I envisioned them. They fit perfectly and tomorrow my buddy will sew the wrist strap extension on. Sara, Got them yesterday, put them in this morning and they are 100% perfect. Fit like they were there from day one. They fit perfectly and with the straps through the block, they weren't as sloppy on my knee. Won the game! Continue to love the knee pads. Slapper from the slot off my knee. The forecast called for pain (Robert Cray Band), but there was none. I know now why everybody loves the knee pads. I've been drilled off the knee a couple times and felt the impact, but nothing else. 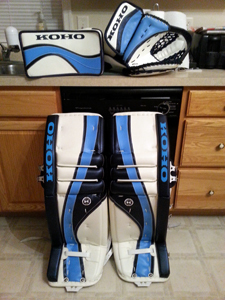 They fit my pads so much better than the Reebok Pro knee guards I swore by. "Thanks for the picture. The knee lock is, of course, perfect. Although I'm getting used to your excellent work, it amazes me each time. It is a pleasure to work with you. You take my rambling descriptions of what I would like and make them happen. It's more amazing given that you do it all after the product is assembled." Took a look at the pictures. My jaw dropped. Literally. You are a magician. Sara, I filed away the pictures of the knee blocks you just finished in a directory with all the other work you've done for me. When you see it all right there in front of your eyes - you've made a lot of stuff for me. All of it fantastic! Thank you so much! That was fast... They came with today's mail, and I just installed them -- absolutely perfect. I just wanted to let you know that I've been wearing your knee pads for three months now and they feel fantastic! Sara, Wanted to give you an update. We got the kneepads, AMAZING quality & construction! 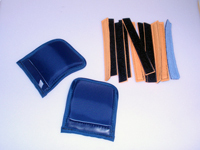 Compared to other “custom made” and “off the shelf” ” goalie kneepads we’d tried, these are many-many steps above all of those in quality of materials and construction. We started using them immediately…with the garter, under socks. They were bigger looking then I had expected, and I was worried they’d be too bulky for him to move around in…..
After the first practice with them, I asked him how the new kneepads were, and he looked at me in shock, he’d forgotten he even had kneepads on, and exclaimed ‘these are the best kneepads ever” (we had tried a few others while waiting for yours, and none of it was any good for him) . Then it came….last night, with his stick out of position, in a very wide/open butterfly he took a coach’s close slapshot right dead off the knee…..in a heartbeat, his eyes went wide inside his mask as he realized what just happened, and he was waiting for the agony….I saw it all, and was thinking “oh boy, this is gonna be bad”…. 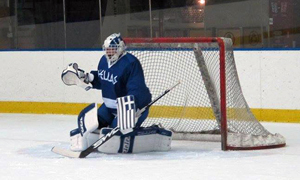 then he kinda gave his head a shake, popped back up and continued on with practice like the shot had just gone off his blocker or leg pads…..I asked him later, and he said he could feel it hit, knew that it hit his knee, but that it hurt more getting hit with a tennis ball playing street hockey, then that shot did…. Just wanted to follow up on my first game since receiving the knee pads. It's been not even 30 minutes since I finished my game, where I faced 38 shots in roller hockey. First thing first, wow, my knees are not killing me like they usually are. Especially my one "needing repair" knee. For sure felt the difference in my old ones to these. I did end up removing my knee cradle this weekend prior to any games in these, and glad I did, save having to relearn what works best strap-wise. Thanks again for a great product, and I can't wait to put a lot more games in them. 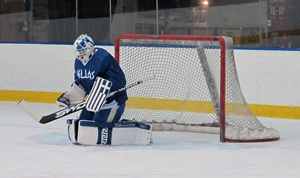 I've already showed two other goalies at that rink what they are, and I'll be sure to share elsewhere as well. Just wanted to send you an update on the knee pads I ordered in January. They're AMAZING! Let me give you some back story here. I spent hours combing the net to try and find a pair that would provide me solid protection, comfort and mobility at a reasonable price but every pair I read about seemed to have pros and cons based on the person reviewing them. Until I started reading about PAW on The Goalie Store Bulletin Board, I couldn't find anything negative about them. I actually started wondering if the reviews were real or if they were all written by friends of your company, I went as far as to research negative reviews, still nothing. This prompted me to purchase a pair of PKP1000s. I've used them about 10 times so far and have no regrets about the purchase. The first time I wore them was a bit of a change, coming from stock thigh boards, but adapting was seamless. By the second skate I had changed some of the strapping and completely forgot I was wearing them after the warmup. They provide lots of comfort when transitioning into the b-fly and LOTS of protection as a I have taken a clapper and a decent snap shot off of them...Nothing! I wear the knee pads under my Wal-Mart brand Under Armour style pants against the skin and they do not move AT ALL throughout the game, no slippage whatsoever. They fit perfectly into my CCM Extreme Flex pads and don't hinder rotation at all. Even more so, my total price came to $130 (that's after a $10 upgrade to eva foam, shipping and duty) which is VERY fair considering knee pads off the shelf can be in that range. Furthermore, they look extremely well made with high quality materials. Thanks so much for making such an incredible product and for the amazing customer you offered throughout the process. First, thank you again for working with me and turning the kneepads and the glove rebuild around. Second, WOW!! Everything is even better than you alluded to. The glove is amazing. Even though I knew it was going to be a little stiff and take a few to break in, it literally took like 5 minutes of working the glove over to feel like it did before I shipped it off to you. All the fixes/adjustments--- wonderful! Amazing job. The knee pads, I was a little worried I got in a little over my head with these things- they looked huge, especially since I have never worn any before. That feeling lasted all of about 3-1/2 seconds. I put them on, put them under my compression-type pants threw all my other gear on and never looked back. I had forgotten I even had then on that first game, except for when I took one off the bottom of my quad/top of my knee… and I remembered they were there because I wasn’t cringing in pain! WOW, WOW, WOW… Thank you so much for such a wonderful product and such masterful repairs. My only “regret”… well, there are two: 1) that I didn’t do this sooner 2)that I don’t have stuff to give any goalie I come across with your information so they can give you a shout! Thank you! Just got into and gosh they look and feel FANTASTIC. Can't wait to use them. They feel so big it's perfect. Just what I needed. Thank you for quickly getting the boot lifts out to Connor. They did the trick and he is now as mobile in the new pads as he was in his smaller/old pads. I received the pad yesterday and installed it on my glove today. It feels great and will work perfectly for my glove that came with no wristpad. Thanks again for another great product. Hi Sara, everything arrived a couple weeks ago and have all been installed. Great work and thanks for a very smooth and easy transaction!! Keep up the good work!! I'll be back for sure! I received the knee pads last Monday. When I first got them, I wasn't to sure about them. Size wise, there were what I expected, but once I tried them on, they seemed very bulky. I didn't think they were going to work with the pads I have. I have had a chance to use them three times now. Each time with a different set of pads. The first time I used them, I thought they were ok, a little uncomfortable, but wasn't willing to give up my thigh wraps for them. The second time out, I didn't notice them as much and thought I could go either way, your knee pads or stick with the thigh wraps I already had. But after the third time out with them, I can say I really like them. I have packed the thigh wraps away and will be using your knee pads from here on. I think they make me a little more mobile and find they are less restrictive than the thigh wraps. 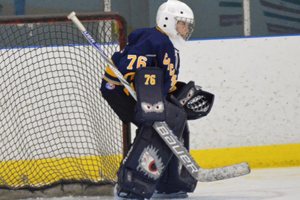 I think my pads rotate better. 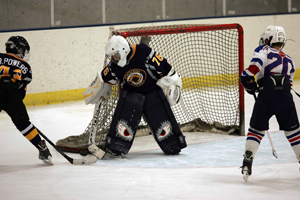 The last time out, I was able to stretch to make saves I am not sure I would have made with thigh wraps on. 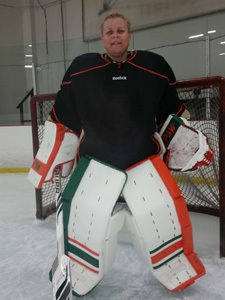 The only down side is that I may need to order two more pairs in different colours too match my other pads. Sara, I wore the kneepads today and I love them. They fit perfect and really helped my knee out as far as support too. They never moved and I just have to get used to the feel of having them on and a little pad adjustment. Thank you so much. Glad I listened to my old coach Mike Sherman and contacted you. I would just like to thank you for the best knee pads I ever used. Photos of his P2000 pads in action! Hey Sara, just wanted to say thanks. Got them sewn in, skated a couple times, all good. Thanks ! Sara, I put your toe straps on my new pads, and have used them about 5 times now. They are so easy to use. I like the fact the buckle is under the pad when they are strapped to the skates. And having the flexibility is also something that I prefer. 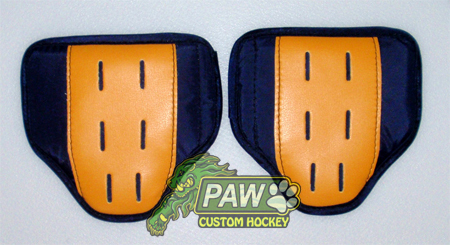 It helps keep the toe of the pads flared out for slightly wider coverage on the ice. I purchased knee pads off you a couple months back, I wanted to let you know they are fantastic. I wanted to play the rest of my winter league before a review of any sorts....All I can say is awesome. They are definitely more protective than anything else I tried, no worries of those odd saves and help to give confidence. Once i had a few games I moved my old knee / thigh protectors off as I didn't even want to put them on. I looked at a few and glad I made the decision to go with these. The price is slightly more than others.....but well worth it and recommended to others all the time (get what you pay for). Thank you again, if I need anything else I will definitely check to see if you have what I am looking for. Just a quick note to tell you that the visco-elastic knee pads you made for me continue to provide excellent comfort and protection - in fact after playing with almost constant knee pain last season I am now almost pain free - the only change has been your knee pads. Got my stuff and had my first use on the ice today. The garter belt was a perfect fit and held my knee pads in place perfectly. The boot risers are awesome too. Dropped into butterfly and landed on knee stacks perfectly everytime. I'll be putting in an order for a goalie jock here in the next few weeks. I had read many fine reviews of your work prior to ordering and you definitely are every bit as good as the reviews say. Hi Sara - they arrived and I've got them installed. Thanks so much - super quick and great quality! Got them on the ice last night for a game for the first time. Very very happy. 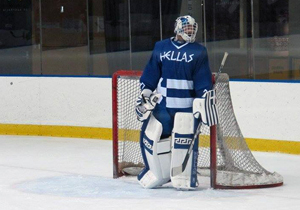 It’ll take a little getting used to playing with knee guards again, but thrilled with how they performed and protected. Infinitely better than the knees I played with before I switched to the Vaughn lace-ins. And way better than the Vaughns. Thanks again! Knee pads received and have been put into action! Thank you very much. You have made some subtle yet very beneficial changes compared to my old set bought in….2006? 2007? Either way, they are still in great shape and being used! Sara- Thank you so much, I can't tell you how happy I am with your kneepads. Perfect fit and function. Love the quality and feel. Keep up the great work! Hi Sara. Just wanted to give you a quick review of the pads that I thought you could use. Out of the packaging - looked and felt a little bulky. Stiff, to be expected. Wore them around the house for a few minutes, not near as cumbersome as they look. Got my first game in with them. At first was worried about extra bulk in the landing gear, so I took out one layer of foam in the knee wings. Initially it felt a little tall, but after five minutes of wearing them, they were noticeably there but did not interfere in any way. Great protection! The wrap around the inside of the knee really helps take the impact from shots that squeak through the five hole and on tips. I wore them under my hockey socks, but could probably get by with wearing them over them as well. Adds an extra step to getting dressed, but much better than having a shattered knee cap or shredded tendon or ligament in the knee. Thanks again! Hello Sara I received the guards today. They're amazing. Same coverage as my old ones but more comfortable. Thank you so much you do amazing work. I've already suggested these to about five different people who were in my situation. Thanks Sara!! They got here last Friday and I got to use them that night. Felt great. You need to make sure to send several cards with them. I play at two different facilities locally and I'll make sure that they have your cards on the board at both places. I just got them just now. I'm super stoked and I can't wait to try them on tonight. I have a game tonight, so I will have a (proper) review this weekend. Just want to wish you and the family all the very, merriest Merry Christmas. I laced the knee stacks that you made for me for my McKenney 890 pads and tried them out last night at shinny at the local rink. OMG, my knees and hips thank-you - your knee stacks are so well made and will last a very, very long time. So much support and protection. 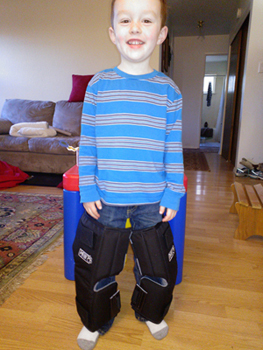 A definite superior upgrade to the standard knee stacks that came with the McKenney pads. I am pleased to support you and am honoured to be able to wear your equipment.